1430 – Currently drinking crazy juice whilst waiting for CT Scans of brain, chest, abdomen and pelvis. Was all pretty straightforward in the end, drank juice, got stabbed with more contrast dye and then scanned, results sometime in the next week or so. The purpose of all of this is to allow the Docs to work out how they’re going to get into my chest to do a biopsy of one of the tumours – preferable to going into my head apparently – which will allow them to target the Chemo correctly. They also want to see if these nasty little tumour things have decided to wander a bit further afield, fingers crossed not! My amazing consultant Dr Geoff Sharpe called to let me know the outcome of the head and body CT scans I had on Monday of this week, needless to say it was initially a wet back of pants moment when I realized it was him on the phone. However it was all positive news, I won’t claim to quote him but my understanding was that my Whole Brain Radiotherapy has had the ‘life saving’ effect they wanted it to, the four tumours (I can only see 3 on the MRI but clearly I’m no expert) in my head have shrunk by 20-30% and growth has therefore for the moment at least stopped. This was the big emergency they had to tackle and what was putting my life under imminent threat. Happy days, looks like Christmas is definitely on! I have three sizable tumors in my chest which have continued to in the Consultants words ‘grumble along’ and grown. No surprises there as they have received no treatment YET, however they are next on the agenda. The good news is they are not currently life threatening and it also suits our purposes as they are now more accessible for biopsy. Sometime in the next week my case is going to a Chest Cancer Multi-disciplinary Team meeting where they will decide how they are going to get to one of these things. So, next steps, chest biopsy to get the 100% diagnosis of what sort of cancer this is, could be a fairly major operation within the next 4 weeks but as the tumors are now easier to get to hopefully not, we’ll see, it’s got to be done either way. Once they’ve got the answer they need they can use the correct Chemotherapy drug to start to deal with them and hopefully reduce/kill them. Following that at some point in the future I’m guessing two months plus potentially further Radiotherapy on my head and there are various other options now for things like Gamma Knife/Stereo tactic (read targeted rather than Whole Brain i.e. using a fine toothed drill rather than a sledge hammer) Radiotherapy. For the first time it was mentioned yesterday that brain surgery to physically go in there could potentially now be an option in the future. This in itself is a huge positive as originally I was told there were just too many tumors that were too big and it was quite categorically not an option. Overall BEST news, no new tumours have developed anywhere else in body! What a relief, our first bit of good (medical) news for two months! Kady and I are over the moon. This is a great blog – must be very cathartic! It is. Just what I wanted it to be, keeps people off my back who want to know how I am also. As previously stated, and at the risk of merely echoing all other well wishers, fantastic news about the scans and I hope the good doctors start to smash all the tumours soon by whatever means that reduces, slows, stops and/or eradicates the buggers soonest. But to more immediate matters … I’ve said it before already on FB, but feel beholden to drive the message home that you do look like the younger, lesser known, Hairy Biker! Ha ha, maybe Kady should follow suit and throw the razor away for a month…. I’m all for equality! Something tells me you may change your mind then Mike!! No way, she’d look like a Gorilla after a month! Great news mate, keep fighting!!! Fantastic news on the scan results I am really pleased for you both. Thanks Karen, yes it was a good day! Excellent news, really pleased for both of you. I bet it puts a whole new light on your first Christmas as husband and wife… enjoy the planning. Chantelle thanks, Kady I hope you’re reading this, see I have a Gold Plated excuse! If this was for Movember, I’d be all over it and have no problem. However, Michael was last seen with a carrier bag full of bandanas and a copy of ‘Harley Davidson Monthly’ magazine. This in itself, is no problem. The fact he was carrying a Depeche Mode and Erasure LP at the time, is a concern. This is all absolutely awesome news and I’m chuffed to bits for you mate! I am, however, concerned that the amazing Dr Geoff appeared to make no mention of the recent apparent aggressive hair growth in the area of your mouth and chin. Onset of ‘Oral Follical Sproutation Syndrome’ is not common for those outside the Gay Biker scene and it is definitely something that should be looked at as a matter of urgency. I would suggest going back to first principles and approaching BUPA again regarding this most worrying of developments. Maybe they could convene a Multi-Disciplinary Facial Hair Action Committee to discuss this issue (not forgetting implementation of a cross-cutting consultation with the Sudden Tattoo Enthusiast Addiction Team) and try and get the ball rolling on some sort of treatment for your condition. (Either that, or you could just go and have a shave. It didn’t work for Travolta so it ain’t gonna work for you…. P.S. This will continue until you apologise for abusing me for being Scottish. Tw*t. I will never apologize so bring it on!!! 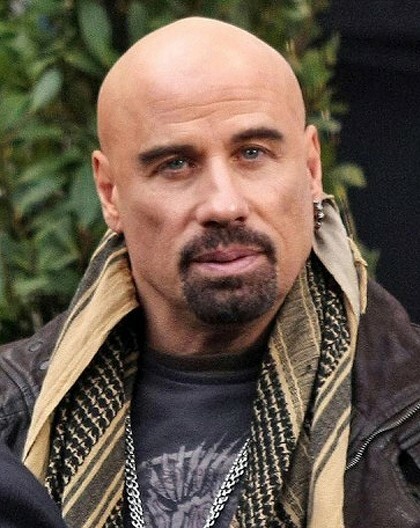 Besides I think Travolta looks pretty cool in that photo. But then I would say that. will be intouch soon to arrange that skype thingy! !